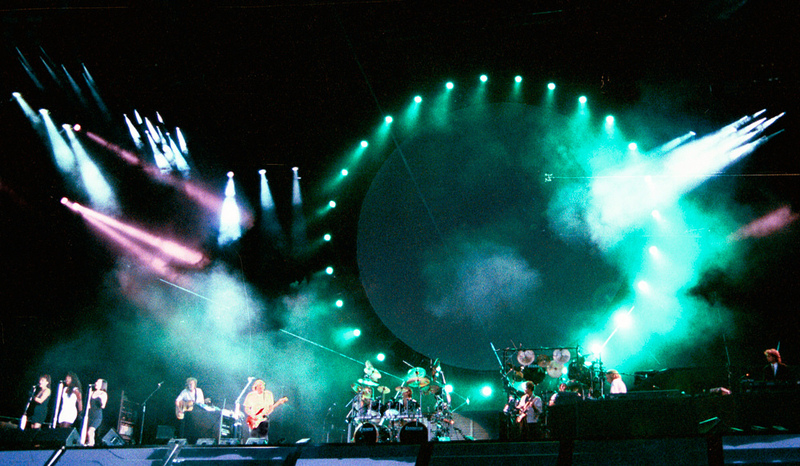 In the final instalment of our three part Pink Floyd retrospective, GARY STEEL reviews the band’s 1988 concert at Auckland’s Western Springs. A drunken adolescent male manages a curious aeroplane dance around a couple of numb-faced policemen before landing face first in the dust. Two lovers tussle and kiss, kept unavoidably close by seriously locked handcuffs. He then gets fascinated with someone else’s shoe laces, helping himself to the task of unravelling them. This can be but one thing: the cluster of zonked out freaks that comprise the Pink Floyd phenomenon. A swelling mass of more than 60,000 bodies. The expected influx of old hippies never eventuates. Instead, high school boys of an ungainly, uncomfortable stage of development make up the numbers; teenagers with bum fluff moustaches, greasy hair and a serious appetite for alcohol, not to mention heavy metal. It’s an increasing trend at such events for half the audience to wander around in a drug and alcohol-induced state of impending (a) violence outbreak, (b) nausea or (c) unabashed enthusiasm to everybody else’s detriment. The last category is the type who waves his fists in the air and slams his elbow in your gut without knowing or caring that his spirited appreciation of “the Floyd” has left you eating the ground. But… to the source of the night’s entertainment. The Amadeus String Quartet was an interesting choice of support and had they been visible would have been entirely satisfactory. They may also have been bottled off the stage. 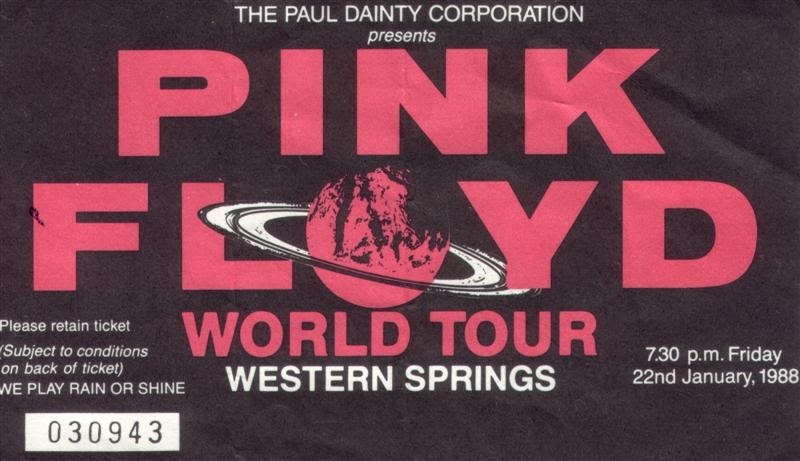 Pink Floyd perform their set in two halves, the first of which began with their weather-beaten ode to original Floyd kingpin Syd Barrett, ‘Shine On You Crazy Diamond’, but which concentrated on material from their comeback album, A Momentary Lapse Of Reason. The second, predictably, was a smorgasbord of audience favourites, culminating in a selection of material from Dark Side Of The Moon, and the song ‘Just Another Brick In The Wall’. The show was spectacular. The music was turgid. The promised quadrophonic sound system was something less AND more than the name implied. The speaker stacks placed around the perimeter of the stadium weren’t used consistently for true four-way sound, but intermittently as sound-effects to add to the main noise, which, as usual, was coming from the stage. The stunning bass bombs, voice meddling, and sound effects resembled the sort of astounding Dolby dynamics that New Zealand cinemas promised but never delivered. Otherwise, the sound was clear and no louder than a good stereo system cranked up on a Friday night with the mates and six dozen beers to guzzle. The light show was stunning. Evil-looking revolving pods moved around dispersing the onstage light while lasers set up spectacular displays in the sky and patterns on the giant pines around the stadium. Film images moved in a circle of light, dry ice whistled around the monster stage and the band may as well have been invisible. Pink Floyd are not interesting in themselves. One can hardly see Nick Mason behind his big bangers, and the three backing singers just look out of place. 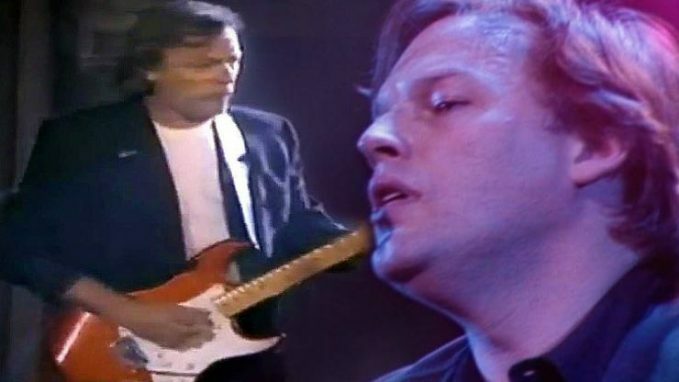 Guitarist-singer David Gilmour takes the limelight, and he is not exactly over-endowed with stage presence. As for his musical talent, his guitar picking makes Eric Clapton (often referred to as ‘old slow hands’) seem like John McLaughlin on speed. Slowly does it. The audience seemed to agree. Pink Floyd music is SO slow, SO turgid, that I have given up trying to work out why I like it and loathe it in equal doses. We all know what we like and what we don’t like about Pink Floyd; how did last night’s show measure up to the record? The new album was performed with conviction, and was transformed by the 3D sound environment from its exceptionally flat sound on vinyl. The old material, for the most part, sounded old, and the band sounded disinterested in it. Pink Floyd don’t play rock and roll, and when they try they sound – as a friend pointed out – like an amateur blues band which can’t even get the basics right. When Pink Floyd are on form, however – as in the first half of the show – their peculiar sound puts across a distinctive, diseased English idealism. Footnote 1: In the last song they reckon they were “comfortably numb.” Could we say the same for the four pedestrians who were bowled over after the concert? Footnote 2: There was no flying pink pig, but there was a big white bed flying over the audience’s head. Believe it, or not! If you haven’t already, check out Gary Steel’s first two instalments his Pink Floyd retrospective: an interview with Nick Mason and a revisit to the band’s pre-concert press conference.